Ideal for transporting many different items around the garden from leaves and waste to pots and logs, the Handy Garden Trolley is ideal for smaller loads. 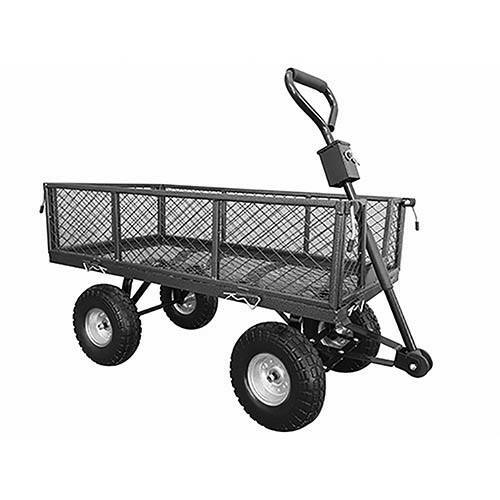 Made from heavy-duty steel, the trolley is long lasting and has steerable front wheels which make it easy to manoeuvre with a long pulling handle. It is highly versatile with drop down and removable sides enabling it to be used as either a flat-bed for outsized objects or simply as a trolley. The high sides make transporting bulky or awkward shaped goods a breeze and simply drop down the sides to unload.